Teaching little kids to use computers is a great idea, but the thought of exposing innocent minds to the drek that flies across the Internet is enough to make a sane parent think about relocating to Amish country. I'm a new parent myself, and as a long-time tech enthusiast, I'm struggling to find the best way to teach my kids about PCs. Letting a kid run wild on a computer with an online connection is a recipe for disaster—there’s simply too much inappropriate content and too many ways to reach it, even accidentally. Sure, you can spend a few hours setting up Windows parental controls, blocking certain content, and installing software to monitor what your kids are doing online. But not only is that a lot of work, it’s beyond the technical capabilities of many PC owners. Luckily, the solution is out there, though it's in the place you'd least expect: the world of Linux. The good people of the open-source Linux community have created specialized operating systems and environments that make the process of setting up a kid-friendly PC a breeze. For the purposes of this guide, we're going to run through Qimo, Edubuntu, DoudouLinux, and KIDO’Z. All of these operating systems limit what your PC can access, so it's easier to keep tabs on what kids are doing. Of course, none of these tools are an adequate substitute for real hands-on parenting with tech-savvy tykes, but they're far more powerful, user-friendly, and educational than the parental controls baked into Windows. If you’re setting up a PC for very young children, then Qimo is the operating system you want to use. Qimo is a free, kid-friendly OS based on the popular Ubuntu Linux distro, with a custom interface designed for very young users. Qimo also comes with a bunch of educational, kid-friendly applications preinstalled, and offers built-in content filtering controls to ensure young users are less likely to encounter unsavory content while they're playing on the PC or browsing the Web. Qimo is an easy-to-navigate operating system based on Ubuntu Linux that is specifically designed for young children. It's a relatively lightweight OS that requires only 256MB of RAM, 6GB of storage space, and a 400MHz CPU to run. Qimo is available as a free download from the Qimo4Kids website, and you can install it on your PC as your primary operating system, install it alongside Windows, or just run it directly from a Live CD or bootable flash drive. To do so, you must first download an ISO file from the website and either burn it to a CD or extract it to a bootable external drive. When done, simply boot to the disc (or external drive) and follow the on-screen prompts to either install or run the OS. Keep in mind, if you install the OS to a system it will wipe out whatever OS already resides on the machine. If you don't have a spare CD handy you can buy a custom-printed installation disc from Qimo for a small fee, which covers the cost of printing the disc and shipping it to you. Like Qimo, Edubuntu is another free operating system based on the popular Ubuntu Linux. Unlike Qimo, Edubuntu eschews a custom child-friendly interface in favor of the Unity Shell, which is the default UI for Ubuntu. That makes Edubuntu a great choice for teaching older kids about Linux, but there is definitely a steeper learning curve. Edubuntu does come with a myriad of educational software suites preinstalled, such as the KDE Education Suite, GCompris, and Tux4kids, but there's no custom content controls or other parental tools built into the operating system. It's basically a straight-up Ubuntu Linux distro with some educational software baked in. Edubuntu is a full-featured version of Ubuntu Linux that includes a wide array of educational software. It's great for teaching older kids about Linux and general computing. Though Edubuntu can be configured to run on thin client computer terminals like those you find in libraries and classrooms, the OS can also be installed on your home PC or run from a Live CD. At one point, there was even a live demo available on the Edubuntu website that would let you experiment with the operating system first-hand. Unfortunately, it was removed by press time due to budget constraints. The process of installing and running Edubuntu is the same as Qimo. Download the ISO file from their website, burn it to a disc or extract it to a bootable external drive, then jack it into your PC and boot to the disc or drive. Edubuntu has pretty forgiving PC requirements: You need just 512MB of RAM, a 1GHz processor and a 20GB (or larger) drive. If Qimo and Edubuntu seems a little too fast for your taste, check out DoudouLinux, another free Linux-based operating system designed with very young children in mind. DoudouLinux is designed to introduce tech to inquisitive kids. 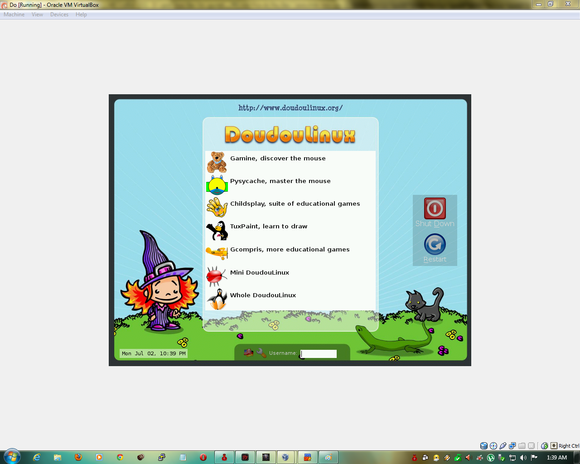 DoudouLinux features a custom user interface designed specifically for much younger children (ages 2 to 12) operating without parental guidance. The operating system is available in almost all languages, and features a full set of OS-level parental controls and content filtering options in addition to a wide array of preinstalled educational applications. The process of getting DoudouLinux up and running on your PC is basically the same as Qimo or Edubuntu, though it requires only 256MB of RAM and an 800MHz CPU. If you don’t want to mess around with alternative operating systems and would rather just install a kid-safe environment on your current PC, KIDO’Z is just what the doctor ordered. KIDO’Z is a subscription-based application with a free trial that's currently available for Windows, Android, Mac OS, or Chrome OS. It creates a kid-friendly interface that provides easy access to safe content. The KIDO’Z environment, which is available for Windows, Android, Mac, and Chrome, puts a myriad of kid-safe content at your child’s fingertips. KIDO’Z has a built-in browser with an ad blocker and real-time content filtering. The browser also has large buttons and direct links to a multitude of popular children’s websites, which helps make accessing everything very easy, even for young children. The KIDO’Z environment also has a full set of parental controls and an App Blocker that lets you prevent unauthorized programs from running on the device. However, there's a catch when using KIDO’Z: The mobile version is free, but the PC version requires a subscription to enable full functionality. There is a free 7-day trial available, but to unlock the parental controls and enable all the features you have to purchase a $4.99 (monthly), $39.99 (yearly), or $59.99 (lifetime) subscription. If there's one thing most kid-friendly operating systems or environments have in common, it's that they usually have minimal hardware requirements. That makes repurposed laptops and netbooks, as well as old, retired PCs perfect vessels for resurrection as kid-friendly PCs. Of the products we’ve discussed here, Edubuntu has the most “demanding” requirements, and even then it calls for only a 1GHz processor, 512MB of memory, and 20GB of disk space. Using retired desktop machines or laptops is a great solution for setting up a kid-friendly PC, especially if you’re worried about very young kids wrecking the system. If you’d prefer to buy or build a new PC that's just for kids, there's really no need to blow your money on expensive components. A basic PC built around an AMD A-Series APU or Intel Core-series processor with integrated graphics should be plenty powerful, and can be had for only a few hundred dollars. For an example of what to buy, check out our guide to building a speedy Windows 8 PC for under $500 and just skip the expense of shelling out for Windows 8. Of course if you’ve only got one PC that everyone must share and can't afford to bring another PC into the house, creating a virtual machine with a kid-friendly OS or using a Live CD is also a great, free option. The Qimo website even offers a preconfigured virtual disk image (VDI) that can be used with VirtualBox or other virtualization software. No matter how you choose to go about it, setting up a kid-friendly PC is a cheap, easy way to share your love of tech with the next generation.